Césarferreiraite: Mineral information, data and localities. Named in honor of César Mendonça Ferreira (b. 1942) mineralogist who established the Gemological Laboratory of the Federal University of Ouro Preto. 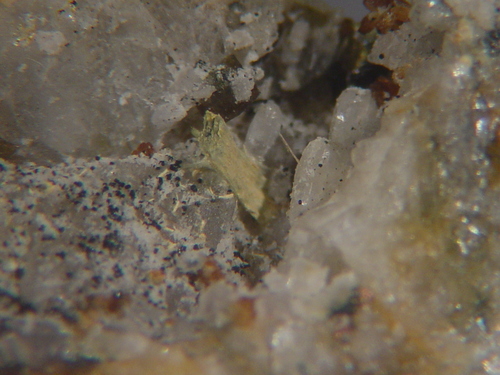 Related to stewartite and bendadaite. 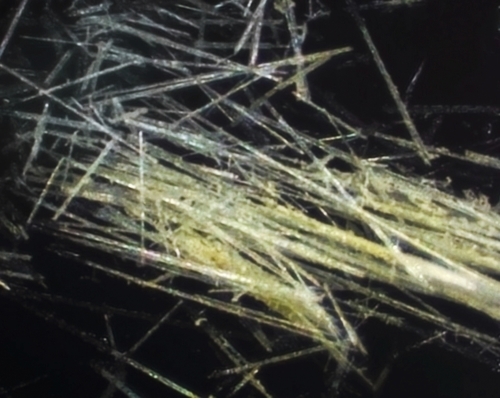 Single crystals, up to 10 μm long with a thickness of about 1-2 μm, are elongated along  and flattened on (100). Scholz, R., Chukanov, N.V., Menezes Filho, L.A., Atencio, D., Lagoeiro, L., Belotti, F.M., Chaves, M.L.S.C., Romano, A.W., Brandão, P.R., Belakovskiy, D.I., Pekov, I. (2014) Césarferreiraite, Fe2+Fe23+(AsO4)2(OH)2·8H2O, from Eduardo mine, Conselheiro Pena, Minas Gerais, Brazil: Second arsenate in the laueite mineral group. American Mineralogist: 99(4): 607-611. Scholz, R., Chukanov, N.V., Menezes Filho, L.A.D., Atencio, D., Lagoeiro, L., Belotti, F.M., Chaves, M.L.S.C., Romano, A.W., Branda˜o, P.R., Belakovskiy, D.I. and Pekov, I. (2013) Césarferreiraite, IMA 2012-099. CNMNC Newsletter No. 16, August 2013, page 2700; Mineralogical Magazine: 77: 2695-2709. Bermanec, V., Scholz, R., Markovic, F., Zigovecki-Gobac, Z., and Chaves, M. L. S. C., 2011, Mineralogy of the Boa Vista pegmatite, Galiléia, Minas Gerais, Brazil: Contributions to the 5th International Symposium on Granitic Pegmatites, Galliski et al., eds., Assoc. Geológica Argentina, Serie D, Publicación Especial 14, p. 33-35. Scholz, R., Chukanov, N. V., Menezes Filho, L. A., Atencio, D., Lagoeiro, L., Belotti, F. M., ... & Pekov, I. (2014). Césarferreiraite, Fe2+ Fe23+ (AsO4) 2 (OH) 2· 8H2O, from Eduardo mine, Conselheiro Pena, Minas Gerais, Brazil: Second arsenate in the laueite mineral group. American Mineralogist, 99(4), 607-611.